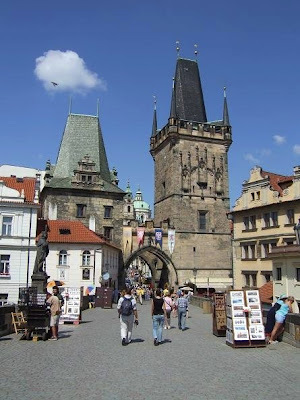 The Powder Tower used to be one of the 13 entrances to the Old Town of Prague. 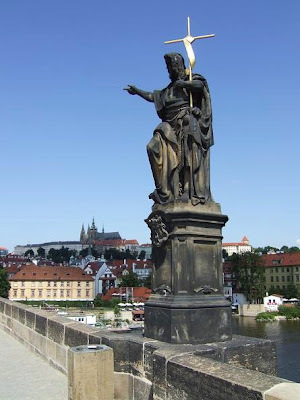 It is located next to the Municipal House, on the beginning of the Royal Way which leads to Prague Castle. The tower was built by Matěj Rejsek during the reign of King Vladislav II in 1475. It stands 65 m tall and is the only existing part of the former fortification. In the 17th century when it was used to store gunpowder, the Powder Tower received its present name. Today you can visit a permanent exhibition of Prague Towers inside or have a look at a collection of photographs by Ladislav Sitensky. It's also possible to have a view over the Old Town from the 44 m high gallery. 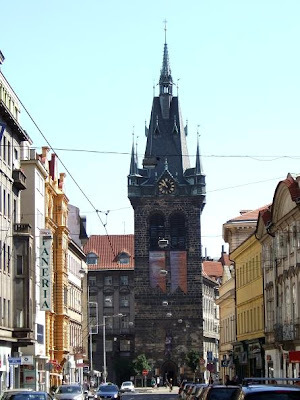 With a height of 67,7 meters, the Jindrisska Tower is the highest separate belfry in Prague. The tower was constructed between 1472 and 1476 in Gothic style. During the centuries it was reconstructed several times because of damages caused by wars and a heavy storm. 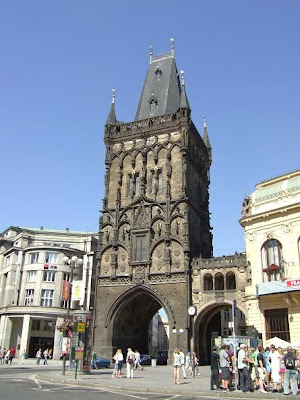 Inside the Jindrisska Tower is a three storey restaurant, the Museum of Prague Towers and a small shop. On the top of the tower visitors can enjoy a panoramic view of the city centre. The Rudolfinum is one of Prague's most beautiful Neo-Renaissance buildings. It was named in honour of Rudolf v. Habsburg, Crown Prince of Austria. Originally designed as an art gallery and a House of Artists by Josef Zitek and Josef Schultz, it is now used for concerts and exhibitions. Between 1918 - 1938, the Rudolfinum was also the seat of the Parliament of the Czech Republic. 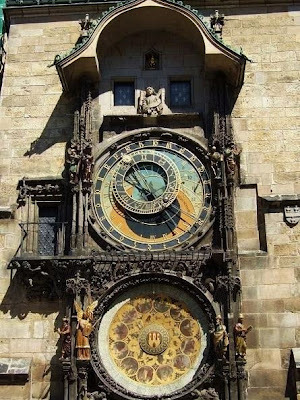 Construction started in 1876 and was finished in 1884 on a location along the Vltava river. 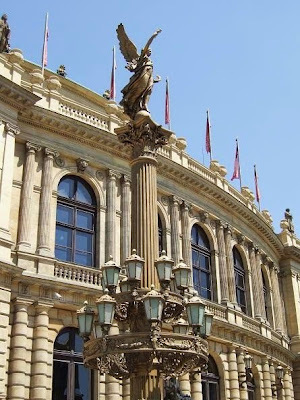 The facade is an analogy of the Semper Opera in Dresden which was destroyed by fire. Next to Smetana Hall in the Municipal House, the Rudolfinum has the most beautiful concert hall in Prague, the Dvorák Hall with excellent acoustics. 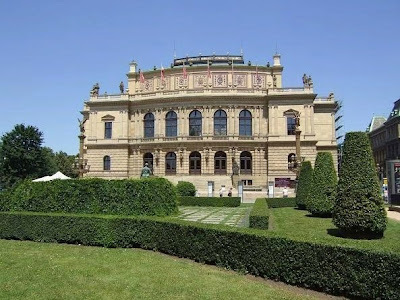 Since 1946 it is home to the Czech Philharmonic Orchestra. 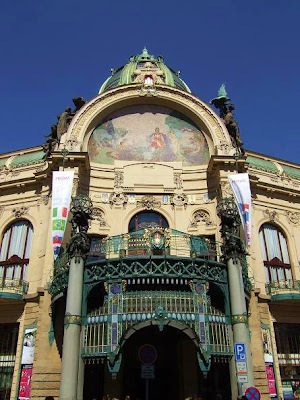 Designed by Antonín Balšánek and Osvald Polívka, the Municipal House is the most remarkable Art Nouveau building in Prague. 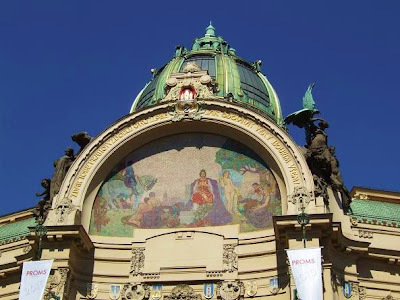 With the input of 30 Czech leading artists, the building was constructed between 1905 and 1911. The Municipal house has a multifunctional purpose, it is used for concerts, conventions, conferences and balls. 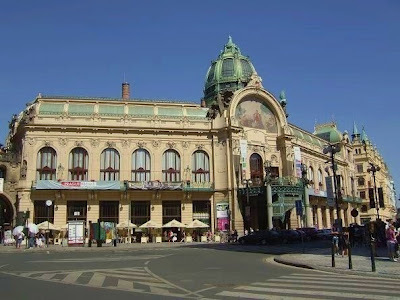 It also houses the most important concert hall of Prague, the Smetana Hall and is home to the Prague Symphony Orchestra. 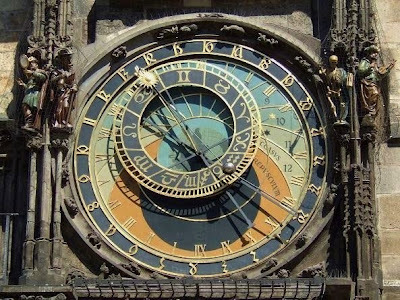 Prague's Astronomical Clock is the most popular attraction on the Old Town Square. 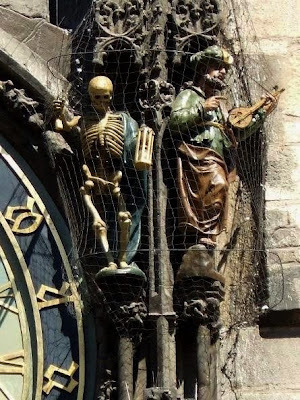 The clock was constructed by Mikuláš z Kadaně and Jan Šindel in the 15th century. 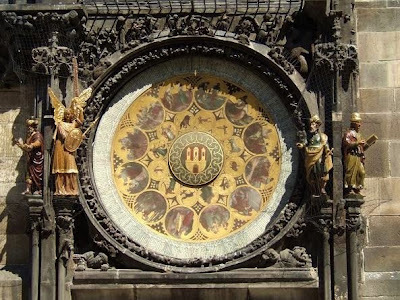 It has three main components, the astronomical dial which represents the position of the Sun and Moon, a calendar dial which stands for the months and "The Walk of the Apostles" which shows a procession of the Apostles on an hourly basis. 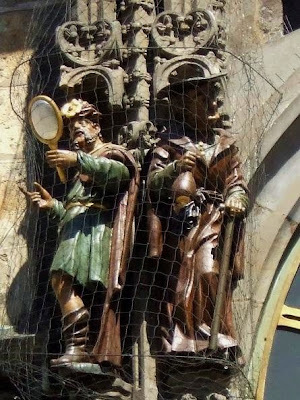 The 8 figures around the clock where added later. 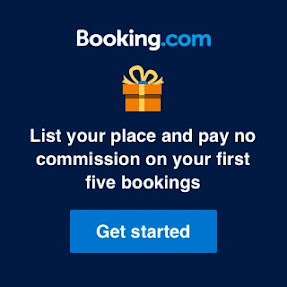 On the main dial are 4 animated figures: Vanity admiring himself in the mirror, Avarice waving a bag of money, Death ringing the bell and a Turk shaking his head. Around the calender dial are 4 figures which are not animated. They are a chronicler, an angel, an astronomer and a philosopher. 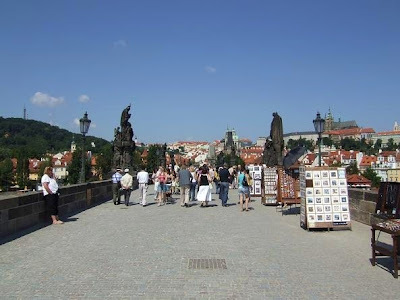 The Charles Bridge in Prague is one of the most visited sights of the city. 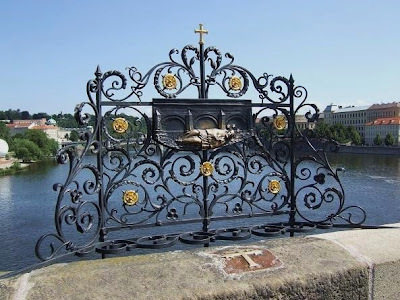 It crosses the Vltava river and connects the Old Town with the Lesser Town. 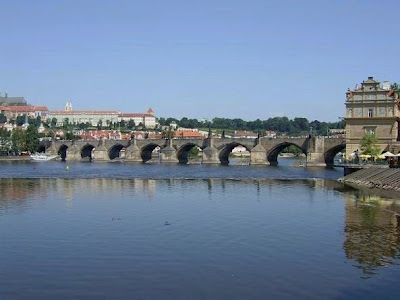 The bridge was named after King Charles IV, who laid the first stone in 1357. It measures about 515 metres long and 9.5 metres wide. 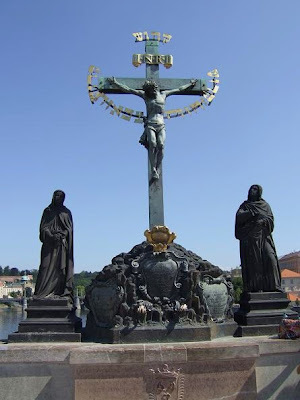 From the 17th century, the Charles Bridge was decorated with 30 Baroque statues. 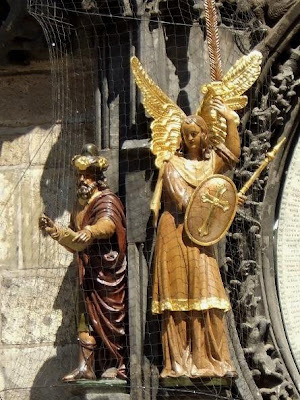 They represent saints and patron saints, the oldest one is the statue of St. John of Nepomuk. 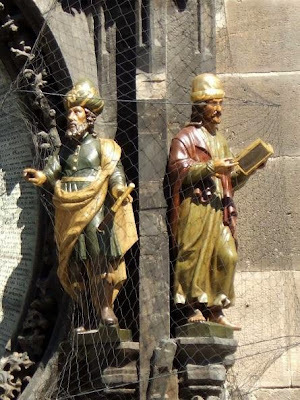 He was executed by being thrown off the bridge during the reign of Wenceslas IV. All statues have been replaced by replicas, the originals can be found in The National Museum. At both ends of the Charles Bridge are towers. The Old Town Bridge Tower in Gothic style and two bridge towers at the Lesser Town side. The lower tower is a remainder of the Judith Bridge which collapsed in 1342, the taller one was inspired by the Old Town Bridge Tower. 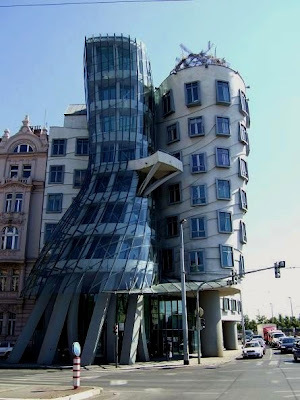 Prague's Dancing House is one of the most famous buildings in Europe. 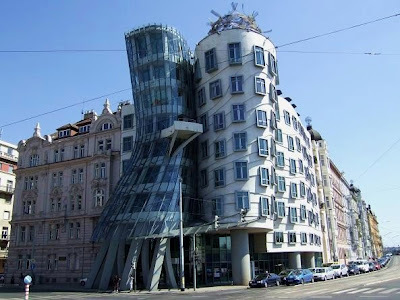 It was designed by Czech architect Vlado Milunic in co-operation with Canadian architect Frank O. Gehry. The building Commissioned by the Dutch Bank ING, was constructed between 1992-1996 in deconstructivist style. It resembles two dancers, with the glass construction in the shape of a women wearing a skirt. This is why the building is also being called "Fred and Ginger". 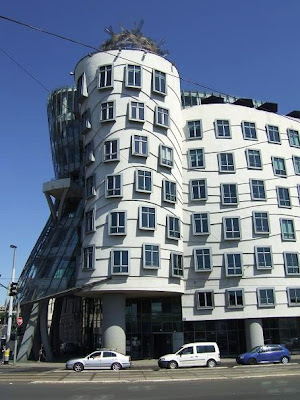 On the 7th floor of the Dancing House is the French restaurant "Celeste". Here you can enjoy delightful cuisine and magnificent views over the Vltava River and Prague Castle. View location in Prague, the Czech Republic. 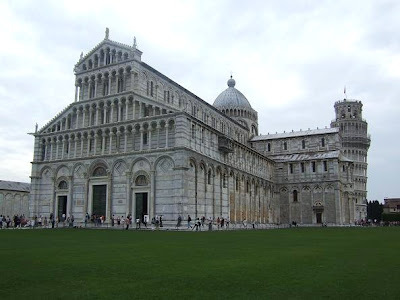 The Santa Maria Assunta Cathedral was the first building that was constructed on the Piazza dei Miracoli. 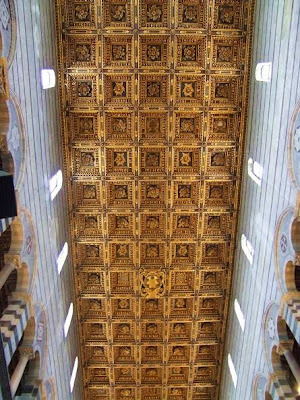 Pisan architect Buscheto started construction of this masterpiece in 1063. 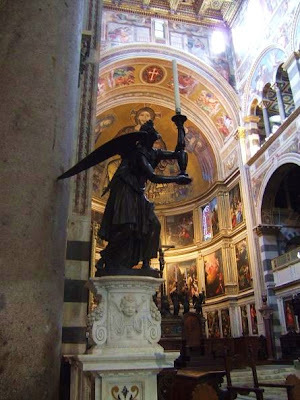 Its architecture became a mix of Romanesque and Pisan style. 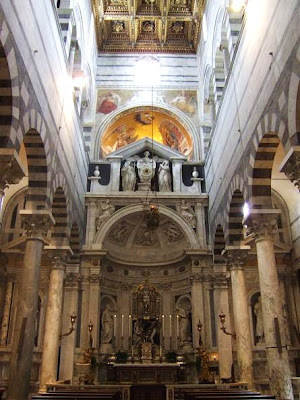 The façade with grey marble and white stone was built later by Buscheto's successor, Rainaldo. 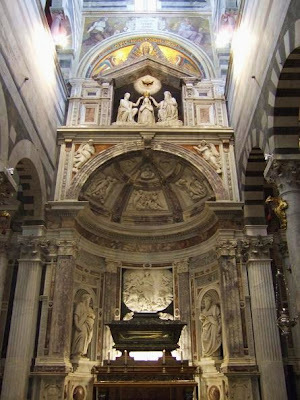 The cathedral contains the Tomb of Emperor Henry VII and the bones of St. Ranieri, Pisa's patron saint. 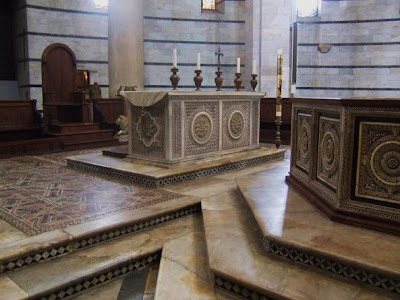 Noteworthy are also the carved pulpit(1302-1311) by Giovanni Pisano and the beautiful mosaic in the apse, representing Christ with the Blessed Virgin and John the Evangelist. Although the Campanile(bell tower) was designed to be perfectly vertical, the result turned out to be somewhat different. Five years after construction started in 1174 by Bonanno Pisano, the tower started sinking into the ground due to poor laid foundation. 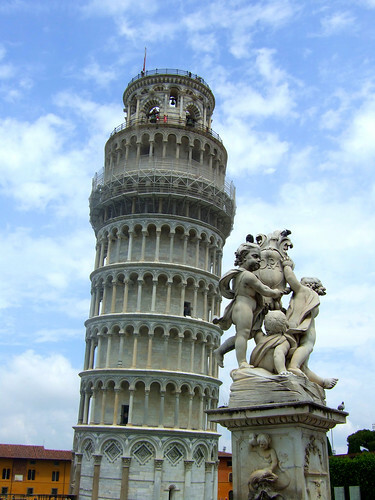 The construction was stopped for almost a century and resumed by Giovanni di Simone who completed four more floors. Finally in 1370 construction was finished after the bell chamber was added. 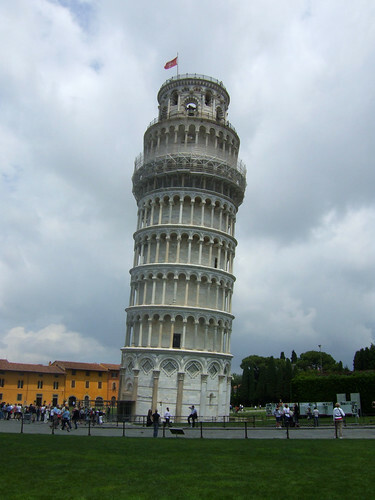 In 1998 work started to stabilize to tower and prevent it from collapsing. Soil was removed from the North side of the Campanile which reduced the lean by 45 centimetres. In 2001 the bell tower was opened again for visitors, allowing 30 people to go to the top at once. The height of the tower is 55.86 meters with a total of 294 steps to reach the top. 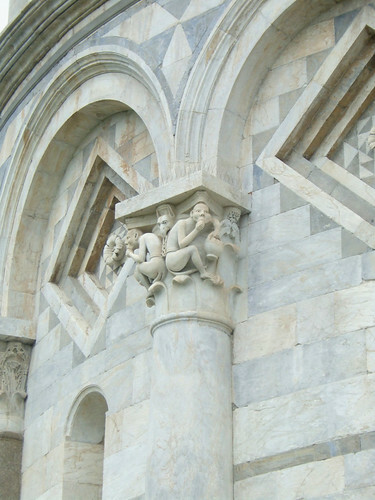 Location: Piazza del Duomo, 56126 Pisa PI, Italy. 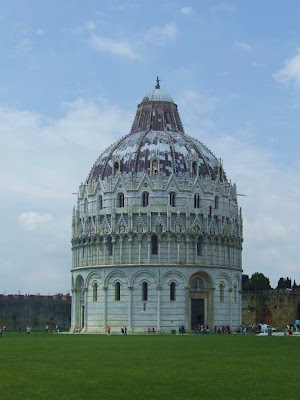 The Baptistery in Pisa was the second building to rise at the Piazza del Duomo. With a circumference of 104 metres, it is the largest of its kind in Italy. 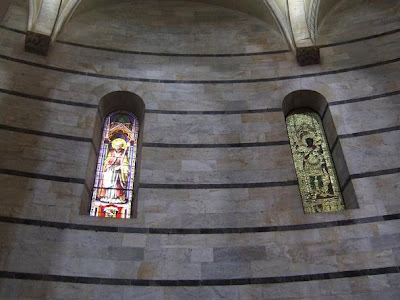 The Baptistery is famous for being the place where the scientist Galileo Galilei was baptised in 1564. Construction began in 1152 by the architect Deotisalvi and was finished at the end of the 14th century. 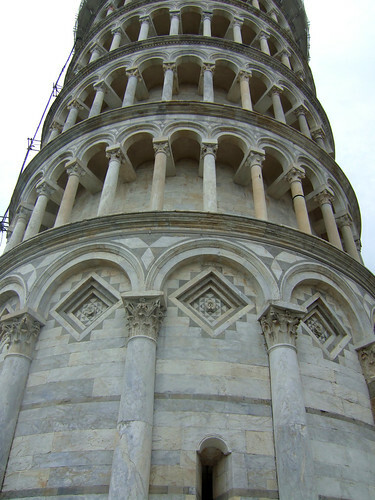 The lower part is made in Romanesque style, the upper part and the dome in Gothic style. 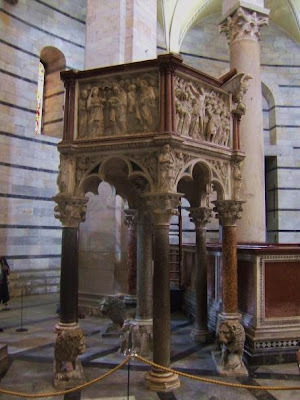 The interior is fairly plain but has two beautiful masterpieces, Guido Bigarelli's baptismal font (1246) and Nicola Pisano’s pulpit (1260).